Golf grips will typically last one to two years. 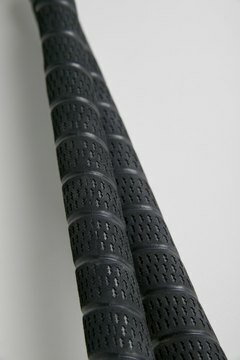 Golf grips start to show wear for the average golfer usually after one or two years. Grips can get slick, and if they aren't changed you run the risk of being unable to hold onto the club, which is not a good thing. Learning to change a golf grip can be a little time-consuming, but once you know how to do it, you can save significant amounts of money by doing it yourself. Place the golf club shaft in a vise and make sure it is secure. Remove the old grip by taking a utility knife and cutting off the old grip. Be sure to cut away from your body. Use the grip-tape scraper to remove any old grip tape left on the shaft. Be extra careful not to scratch the shaft when doing this. If there is any residue left on the shaft after taking the grip tape off, use a little solvent on a rag to get it off. Now, clean the shaft with soapy water and be sure to dry thoroughly. Once the shaft is completely dry, measure the length of the grip next to the shaft and apply double-sided grip tape to the shaft to match the length of the grip. Peel the backing off the double-sided tape. Cover the little hole at the top of the new grip with a finger and pour a little grip solvent into the grip. Shake the grip gently, so the solvent covers every inch of the inside of the grip, then pour the remaining solvent over the double-sided tape on the shaft. Start sliding the new grip over the end of the shaft, and make sure the grip is centered and correctly positioned to the square club face. The solvent should make the grip slide on easily. Take the club out of the vise and let it sit for 16 to 18 hours to dry. The club is ready to be used once it's completely dry.